ANAHEIM, Calif. (AP) — Los Angeles Angels rookie Shohei Ohtani will throw a bullpen session Saturday in the latest significant step in the two-way sensation’s return to the mound. Angels manager Mike Scioscia announced the decision Tuesday before Ohtani batted third as Los Angeles’ designated hitter against Detroit. Ohtani hasn’t pitched since June 6 after spraining a ligament in his elbow. Ohtani and the Angels are attempting to determine whether he can return to regular pitching without needing Tommy John surgery. Ohtani won’t throw at maximum effort in the bullpen session, which will be his most elaborate work off a mound since his injury. 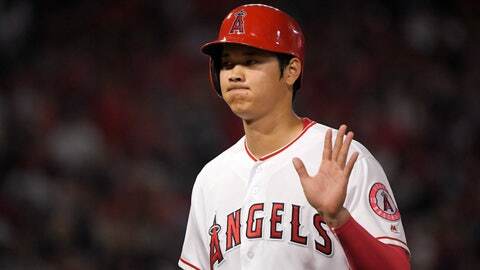 The Angels are still optimistic Ohtani will pitch in games again this season. Ohtani went 4-1 with a 3.10 ERA and 61 strikeouts over 49 1/3 innings in his first nine big-league starts.